One of the best parts of the Habitat trip was meeting other volunteers. The other volunteers included people in our group, homeowners, and local volunteers from Hajdu. Erica lives in Hajdu. She's 18 and came to work on the site every day from 8am to 5pm. She wants to practice speaking English and found that working with the English speaking Habitat groups has helped her. She was also the Superstar worker bee. 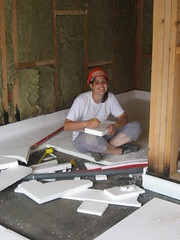 Erica never wanted to leave a project unfinished and begged to skip lunch so she could just finish insulating a wall. Inspirational, to say the least.